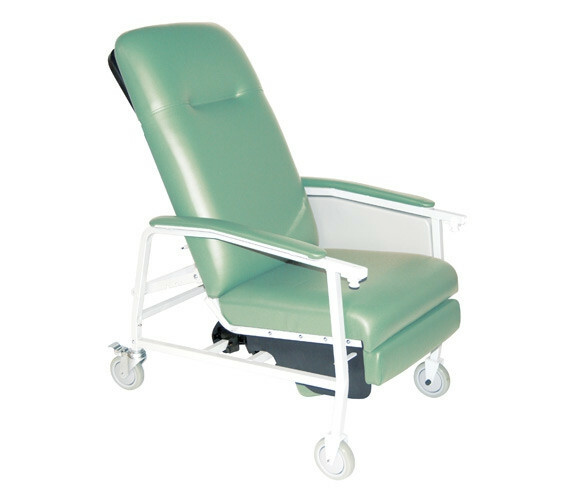 Geri Chair Recliner 3 Position by Drive Medical is a retractable chair that features 3 comfortable positions, a retractable lock bar, self-adjusting suspension, and a convenient side tray. 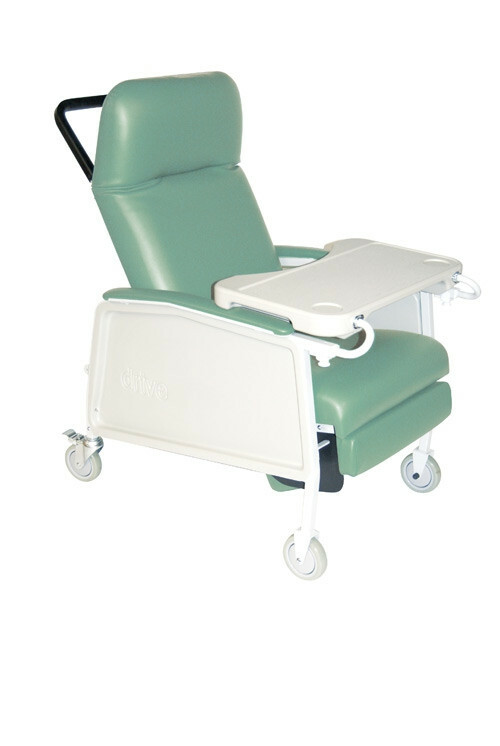 It is easily adjusted to an upright or deep recline position with an elevated footrest. It also features a lock bar that allows it to stay securely in the desired position. It contains a moisture barrier and suspension that keeps the seat from "bottoming out." 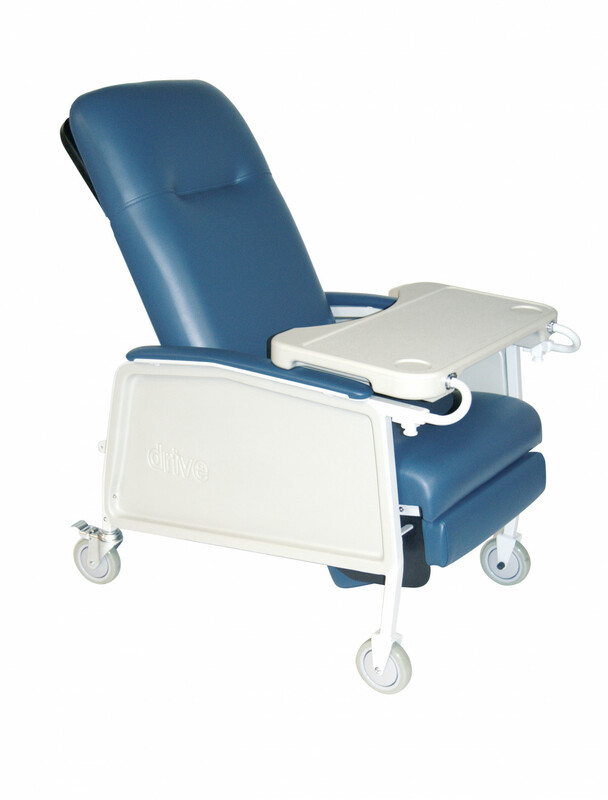 It features a large tray that locks in 5 positions, which can easily and quickly be stored on the side of the chair. It has a comfortable headrest and padded arm rests. 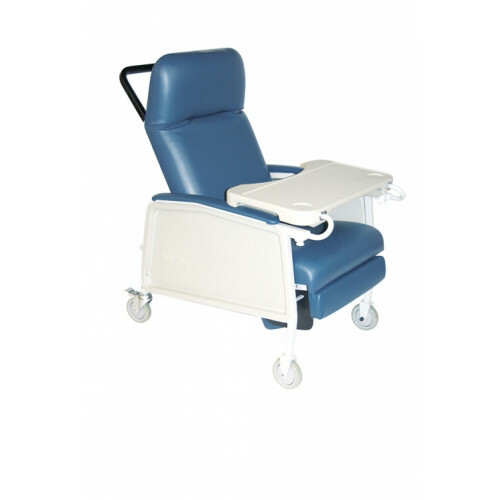 It has 5 inch casters that allow it to be moved into a secure position and a sturdy and durable frame that is simple to maintain and sanitize for maximum patient comfort and cleanliness. The side panels are removable for quick and easy maintenance and can easily be wiped clean with wipes, such as Clorox Disinfecting Wipes. This recliner is made from vinyl and foam that meets the California Flammability standards and the Boston Fire Department Specifications. The frame comes with a limited lifetime warranty and the upholstery comes with a 1-year warranty. It has a 250 pound weight capacity and comes in the following colors: jade, rosewood, and blue ridge. 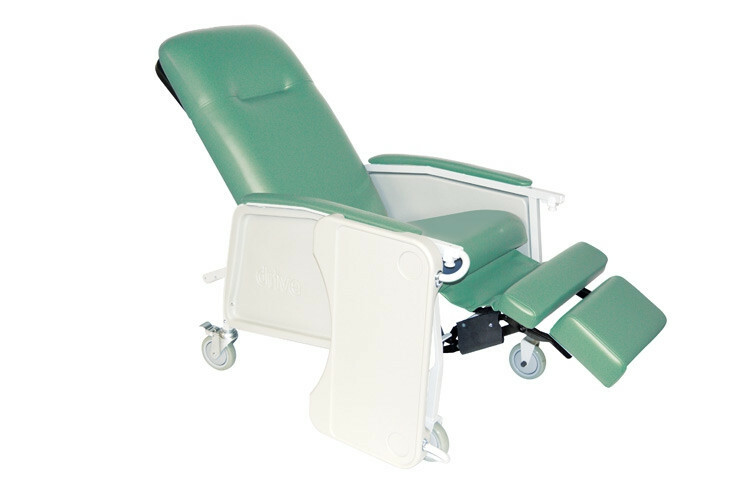 The width between the arms measures 20 inch and the overall dimensions are: 47 (H) x 25 (W) x 41 (D) inch and the seat dimensions are: 9 - 26 inch. Information Sheet Contains Product Information. Product Manual contains use and care instructions. Do you have color samples in the material the chair is made from?I would like to have it before ordering. Hello Mrs. Brissett: Unfortunately we do not offer samples to customers. In order to possibly receive a sample of a product we carry, it's best to contact the manufacturer directly.